Have you ever made SEO recommendations that just don’t go anywhere? Maybe you run into a lack of budget, or you can’t get buy-in from your boss or colleagues. Maybe your work just keeps getting deprioritized in favor of other initiatives. Whatever the case, it’s important to set yourself up for success when it comes to the tangled web of red tape that’s part and parcel of most organizations. In this week’s Whiteboard Friday, Heather Physioc shares her tried-and-true methods for building yourself a toolkit that’ll help you tear through roadblocks and bureaucracy to get your work implemented. What up, Moz fans? This is Heather Physioc. I’m the Director of the Discoverability Group at VML, headquartered in Kansas City. 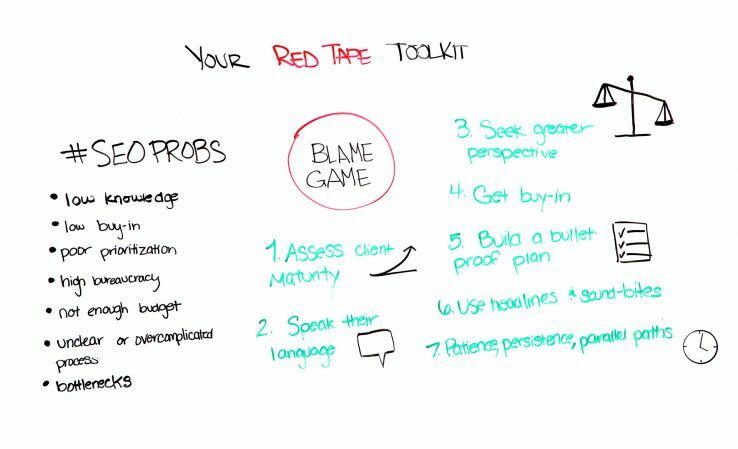 So today we’re going to talk about how to build your red tape toolkit to overcome obstacles to getting your search work implemented. So do you ever feel like your recommendations are overlooked, ignored, forgotten, deprioritized, or otherwise just not getting implemented?